I'm trying to run a game that requires the colours to be set to 256 but when I try using the -bpp parameter with either 16 or 32, I get an error message saying the colors have to be set to 256 and then the program closes. Is there a way I can force 256 color mode? Wine will trying to emulate 256 color mode for older games because modern video cards no longer support this. But it doesn't always work. Do you know if this game works on Wine under Linux? I don't know if the game works with wine under Linux as I don't have a linux install to test it with. The game is Revival Eggerland. The game needs Windows 95 in 256 color mode to run, so I can't get it to run under Windows 7/8/10 with any compatibility settings. I didn't find a demo of Revival, but an older version Quest for Rara had the same 256 color check, but showed a popup to allow it be played anyway, I take it you copy of Revival didn't allow for that. Wine allow 256 colors to work without changing the desktop to 256 colors, but if the game checks the desktop then there is nothing Wine can do about that. I did mess around with getting Boxedwine to support 256 colors in its virtual desktop, but the colors kept coming out wrong. I guess I'm doing something wrong with the palette. I will probably revisit this again in the future since there are other games that this happens to too, like Westworld 2000. 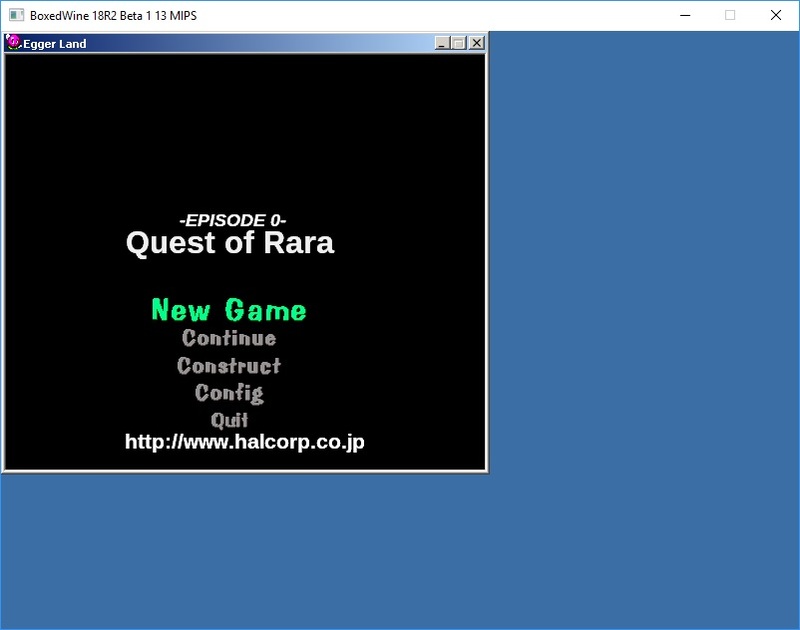 The Quest for Rara I was using detected 256 color mode and didn't warn me about it any more, but starting a new game crashed for me, hopefully your version will do better. Can you give me the command line options you used to run the game? I downloaded 18R2 Beta 1 and when I try to launch the game I'm just getting a white screen now. If this doesn't fix it, could you let me know the command line you used and paste the output from the console? I downloaded the new version you linked and now I can't get anything to run. I tried using the command you posted, and get the following error message. I also get the same error message when I try to run the full tilt pinball demo now as well, whereas it worked before. I get this error message in the console and then nothing happens and I have to close it manually. When I tried using the same command, but switching to fullWine3.1-v3.zip, I get these error messages, followed by a white screen again. 0009:err:winediag:wined3d_adapter_init You are using the backbuffer for offscreen rendering. This is unsupported, and will be removed in a future version. 0009:fixme:d3d:wined3d_adapter_find_polyoffset_scale No FBOs, assuming polyoffset scale of 2^23. 0009:fixme:d3d:wined3d_swapchain_cs_init Add OpenGL context recreation support. It looks like both of those console outputs are both dealing with OpenGL trying to initialize. The filesystem for Boxedwine looks for files on the host computer, and if it is not found then will try the zip file. So in this case it looks like it is using the previous registry for Wine because when it first runs, it uses the zip files version, but will then save to the host computer in the fs/home/username/.wine directory. So I suspect when you ran beta 1a with the new file system changes, those changes were not used. To fix this I recommend that delete your directory and unzip beta 1a again and start over, or if you want you can just delete fs/home/username/.wine on your host system (not in the zip file). When something used to work and no longer works, my first thought is always delete the .wine directory. If a program was installed previously, it will need to be reinstalled. fixme:ddraw:ddraw7_WaitForVerticalBlank iface 0x124fa8, flags 0x1, event (nil) stub! I was able to fix the crash, but now when I start a new game I just get a black screen with 2 white boxes. The smaller white box is the cursor and the larger one I can move up and down with the keyboard. I guess its progress. How were you able to fix the crash? It was a code change to stop the crashing, but since I don't see the demo drawing correctly, I'm not sure about the fix. It really looks like it's just not loading the bitmaps correctly since it response to mouse/keyboard command, but I only see 2 white boxes. Were you able to make any more headway getting this game to run? I was just thinking about this again, but I'm not at home to download and test the new version right now.